I love receiving your newsletter. My son is a 13 year old Level 9 gymnast (Level's go to 10 and then college competition). He has developed O-S and other than the traditional ice and rest (which won't happen) do you have any advice? Prior to the adolescent growth surge, most young boys have excellent flexibility, not dissimilar to that of girls. With the onset of puberty the surge of testosterone initiates rapid elongation of the long bones of the body as well as a hardening of connective tissue, including the tendons. In addition, the rapid bone growth draws on every available store of minerals such as calcium and magnesium, depleting muscles and other organs. Calcium and magnesium regulate muscle tension. Points where the long bones grow (Growth plates) become vulnerable to injury from sudden traction and compression forces such as when landing during a vault, or kicking a ball. As the long bones elongate, the muscles and tendons tend to lag well behind causing a loss of strength, agility and flexibility. The loss of flexibility may appear to happen almost overnight and can easily happen unnoticed by the coach. Protein and other nutrients are needed in large supply throughout the day and are often in a state of chronic shortage in the adolescent athlete, very much thanks to the predominance of cereals, low fat foods and the instant noodle. The mineral depletion, lack of quality protein, plus the loss of flexibility leaves the young athlete vulnerable to the kind of injury that is Osgood-Schlatters. Osgood-Schlatters happens when the large tendon of the qudriceps (thigh) muscles contract suddenly, such as kicking or jumping. 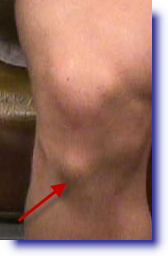 This injury may appear as a hard, tender bump below the kneecap (Refer image above left). A similar injury may occur at the heel bone where the large calf muscles attach via the Achilles tendon. Very intense knee pain is usually the presenting symptom that occurs during activities such as running, jumping, squatting, and especially ascending or descending stairs and during kneeling. The pain can be reproduced by extending the knee against resistance, stressing the quadriceps, or squatting with the knee in full flexion. Pain is mild and intermittent initially. In the acute phase the pain is severe and continuous in nature. Impact of the affected area can be very painful. While nobody has ever died from this condition and full recovery is inevitable once growth is complete, it can result in loss of form and enjoyment of activity. The young athlete also risks being left with a permanently unsightly and often annoying pair of boney lumps. My inclination is to do whatever is necessary to prevent this from happening. Rest - But this does not necessarily mean stopping the gymnastics. What this entails is rest from the offending activities. This means your son can do everything other than leaping and landing for as long as is necessary for the pain to disappear. This time can be the opportunity to concentrate on areas of weakness that do not involve tumbling and vaulting. If he has not learned to swim, as all boys and girls should, then now is the opportunity. Active Elements 2.1 and 2.3 - These have the tissue salts that the growing body requires for bones and tendons that are strong and resilient. He can take about 6 per day for as long as there is any pain and discomfort. Anti-inflammatories - Read my article here about why these drugs should not be taken, especially by youngsters. Cortisones - No! Read my articles here about the horrors of this misguided treatment. Stretch gently - and avoid vigorous bounce stretching. Frequent meals - five per day, high in protein, complex carbs, fats and minerals from relatively unprocessed sources. You will gather that I am not a fan of pasta and noodles. Please read this E-Book here which I have written for parents and coaches of talented young athletes. Above all, be patient, give it time to settle and always ensure you place his longterm welfare before all else. I seem to be expierencing the same pain that you described. I have had this disease for about a year now. I just turned 20 when do you think this will cure by me resting or by the end of the growth spurt? It should be starting to settle from now because you are at the end of your growth spurt. Reparen is a specialty bone, tissue, muscle repair and support complex. Reparen is a water soluble, rapidly absorbed and highly bioavailable source of ionic calcium phophate that can assist in the treatment and prevention of osteoporosis, tissue repair and sports injuries, maintains healthy heart function, nerve function and transmission, cellular energy, assist in hormone secretions and enzyme activity, supports better health and improved recovery. Reparen is made from a special high-grade preparation of monobasic calcium phosphate that improves vital calcium and phosphate balances in the body. Each capsule contains: 750mg monobasic calcium phosphate as Calciphos(R) equivalent elemental calcium 119.25mg. Thank you for the useful information! Since I play basketball competitevly I seem to expierence more pain by the more strenuous activities that I do. Do you suggest that I take a couple of months off to recuperate? And if so will it be affective. Isaac, if you follow the exercise and nutrition advice I have given you will not need to rest. Rest alone may not be best because you may decondition, losing strength and stamina. Moderate exercise with diet and the supplements and you should be well on your way. I just noticed the bump under my left knee (Osgood-Schlatters). I am a 47 year old (and I stopped growing LONG ago). I play soccer with the kids and jog with my wife occasionally, but this seems to have appeared out of nowhere. I am a photographer, and I do kneel or squat when taking photos. I also have been taking Crestor for about 3 months. I have not experienced muscle pain, but wondered if this condition was linked to Crestor and muscle weakening? Even if the bump is more due to kneeling than anything else, I have no doubt that Crestor is adding to the problem. The range of ailments associated with statins is huge and growing daily. In my opinion, these drugs should be banned. Why Drs continue to prescribe these drugs like lollies in the face of mounting evidence of harm, is beyond me! There are effective natural health therapies for cardiovascular health. Contact me directly if you want to go down this path.